It's been many years since we have taken a tour of the Crystal Cave at Put In Bay, Ohio. Looking for something new to do with our granddaughter as we visited the island and some family we have there, we decided to introduce her to one of South Bass Island's more unique sites. The cave is actually a geode that was discovered by workers in 1897 who were digging a well for the Heineman Winery above ground. 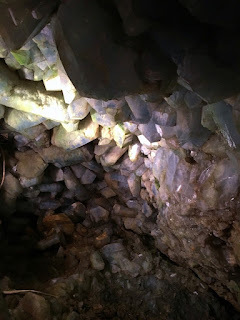 The walls of the cave or geode are covered in strontium sulfate, a bluish mineral called celestite. 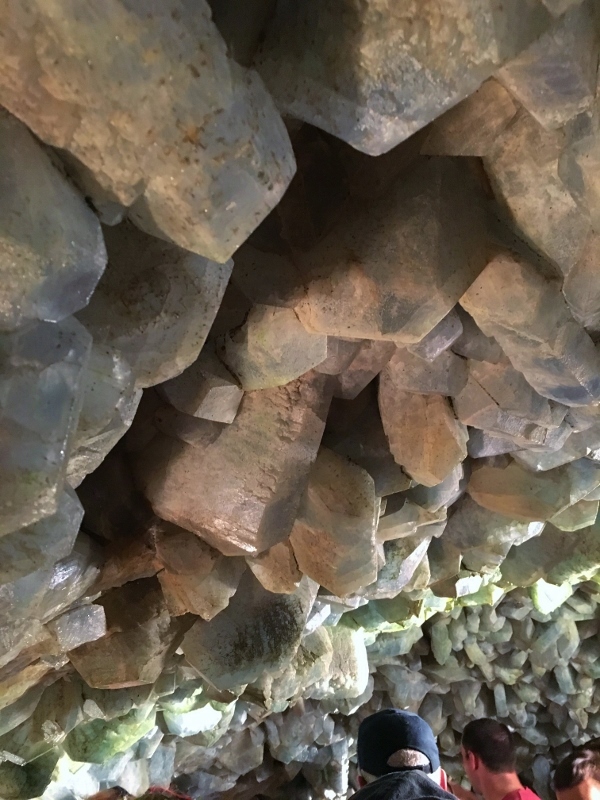 The crystals are not as blue as they once were because of the lights that work with the natural moisture in the cave to create a greenish algae. The crystals of the cave range in size from 8 to 18 inches. Some have been removed to allow enough room for visitors and create a floor to walk on. The removed crystals were used for manufacturing fireworks. It gives off a bright red color. During prohibition days, the family owned winery was helped to pay its bills by offering tours of the cave since it was not allowed to sell alcohol. An $8 ticket gives you a tour of the cave and the winery and a token for a small glass of wine or grape juice. We skipped the winery tour since we were running short of time but we did enjoy a glass of grape juice while we waited for our tour to start. Heineman's grape juice has a unique taste totally different than Welch's from the grocery store. I don't know of anywhere else in the world where you can walk inside a rock. If you can manage the 42 steps down and back up take a look. It's worth the effort.